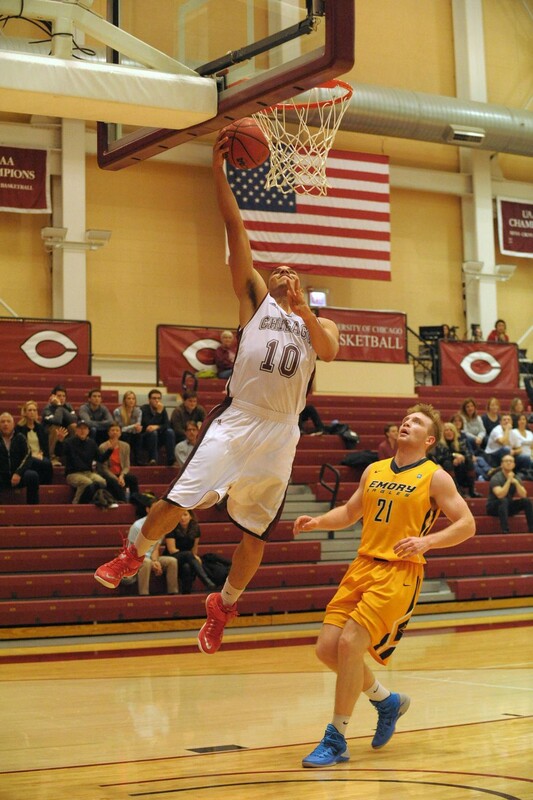 Fourth-year Waller Perez goes in for an impressive high-flying layup. For the occasion, Case Western Reserve University invited back many of their alumni from the original colleges which had made up the university, including Western Reserve University, Mather College, and Case Tech. The game was even played in an older, retro gym and the Spartans sported the original uniforms from Mather College. The competition held up to the hype, as the game was a nail-biter throughout with a total of 19 lead changes, with Case having the biggest lead against the Maroons with 14 points. Fortunately, the South Siders pulled through at the end when they were down 72–71 with 3.5 seconds on the clock. Third-year shooting guard, Jake Fenlon was able to pull up and nail a three-pointer, bringing the score to 74–72, solidifying a victory for his team. On Sunday, Chicago was on the road again, this time to Pittsburgh, Pennsylvania, to face off against the Carnegie Mellon Tartans. This proved to be an even more difficult battle for the Maroons as they had to fight back from a deficit the entire match, with the largest gap being 19 points. From every position the Tartans were a solid match-up for the Maroons, especially inside the posts. “Carnegie had a lot of height down low, it was a little difficult for our guys to defend. We had to be smart and know that we couldn’t be muscled under but would still have to play straight up on the catch to avoid fouling,” said second-year point guard Max Jacobs. This game became a shootout for the Maroons as Carnegie’s defensive efforts did not allow much offensive penetration. Fenlon proved himself again offensively as he led his team with 30 points off of three-pointers, but the effort was not enough, as the Maroons fell to Carnegie 89–80. Going into the weekend, the Maroons are currently 3–4 in the UAA and in fifth place. Friday’s match against the Case Western Reserve Spartans will be played at 8 p.m. in Ratner Athletics Center following the women’s match. Sunday’s game against the Carnegie Mellon Tartans will begin at 12 p.m. in Ratner Athletics Center.